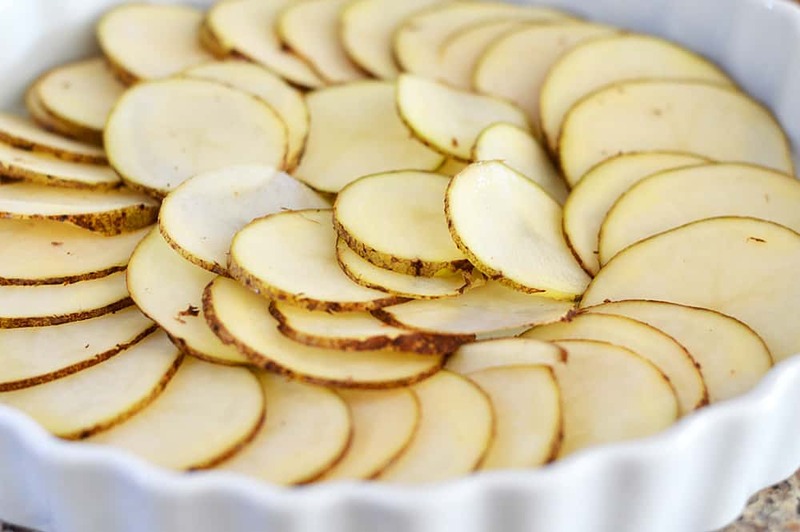 It all begins with thinly sliced russet potatoes. Try to choose some that aren’t overly large or your slices will overtake your baking dish. You don’t have to arrange them, but I like the presentation. I created a basic white sauce made from vegan margarine, flour, salt, pepper, almond milk and vegan parmesan. Then, I added the diced veggie hotdog. I topped a layer of potatoes with half of the sliced onions, half of the sauce and a sprinkling of the parmesan. Then repeat with another layer. Bake until bubbly and golden. This can take upwards of 50 minutes or more. 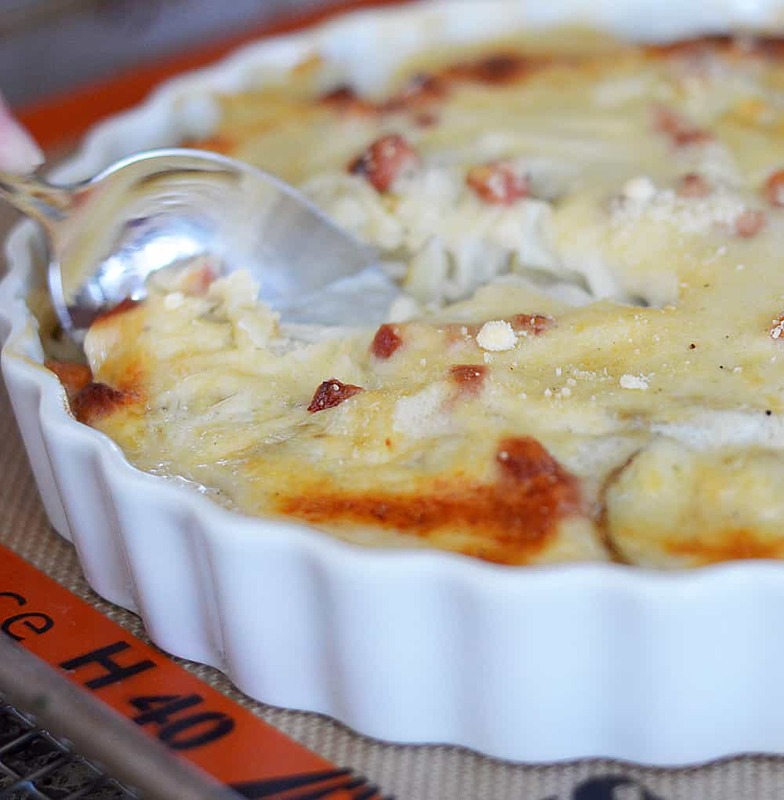 Did you make this recipe for VEGAN Scalloped Potatoes and “Ham”? Leave me a comment below and let me know what you thought! 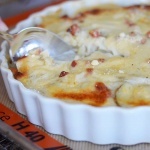 VEGAN Scalloped Potatoes and "Ham"
In a saucepan, melt vegan margarine and stir in flour, salt and pepper until smooth. Gradually whisk in almond milk. 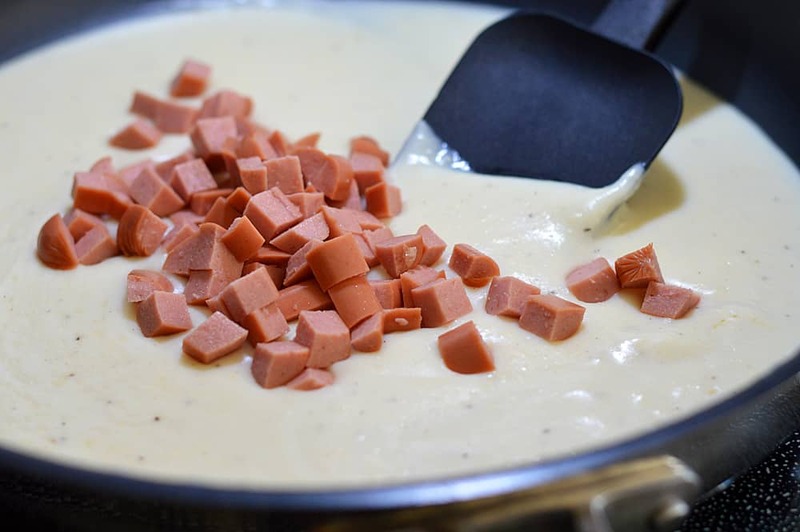 Bring to a boil, stirring constantly; cook and stir until thickened, about 2 minutes. Remove from heat; stir in vegan parmesan and diced vegan hot dogs. 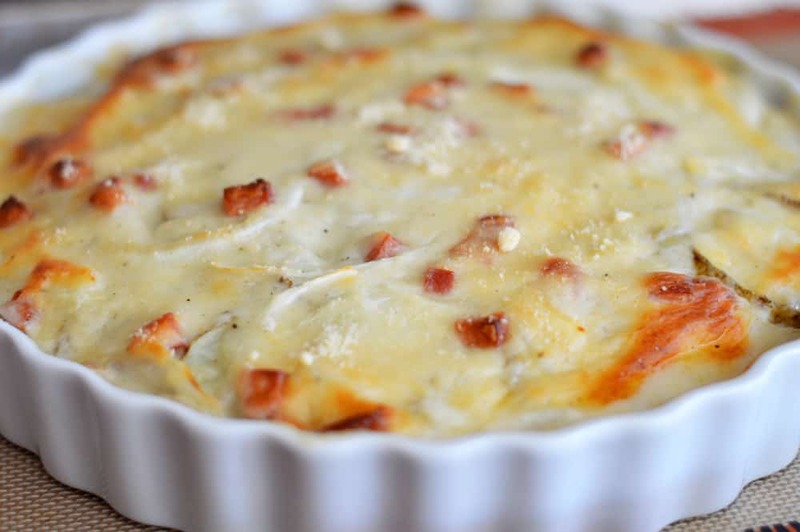 Place half of the potatoes in a baking dish coated with cooking spray; layer with 1/2 of the onion and half of the vegan cheese sauce. Repeat layers. Top with additional vegan parmesan, if desired. Bake, covered, 50 minutes until bubbly and potatoes are fork-tender. How many vegan hot dogs do you use? They are not mentioned in the ingredients.